Today we have a special guest on the show! Simone Braverman from IELTS Blog will show you three IELTS tricks for a higher score! These tricks will show you how to do better on the IELTS Reading test, the IELTS Listening test and how to plan your study time. Simone reminds us that you need to prepare for the exam and use the structure to your advantage. This will help you reduce errors, save time, and get a better score. Tip #2: Do things in the right order to save time: On the Reading test, time management is a problem for a lot of people. The order in which you do things on the Reading test can save time. Many people say that matching headings takes a long time but if you do it by paragraph order, you can save time. Do it paragraph by paragraph. Don’t go in the order of headings. Go to paragraph 1, look at the list of headings, pick a suitable one. Next, do the same with paragraph 2. This way you won’t read a paragraph more than once. You will not be wasting time. The less you read, the more time you save! 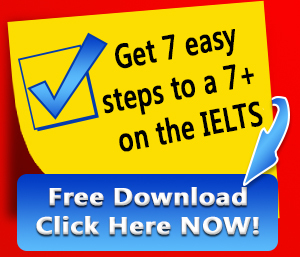 Do you need a 7 or higher on your next IELTS Exam? Do you know where to start when it comes to preparation? Get our free IELTS Cheat Sheet now! Tip #3: Find out what your weaknesses and strengths are: Everyone is different. Try to find out where you need to focus as soon as possible. You can do a practice test at home under real exam conditions. Do the Listening test without stopping the recording and do the Reading test within 60 minutes. When you finish, take a look at where you got stuck. Did you run out of speaking ideas? Was the problem time management on the Reading test? Don’t just continue doing practice tests and repeating the same mistakes. Once you know your weaknesses, go back and focus on building the right strategies. Simone Braverman helps busy people whose English is far from perfect to score high in IELTS (higher than they ever expected) after a short preparation in their spare time – even if they scored low previously, have a learning disability, spend all their time at work or are afraid to death of exams. Simone is the creator of a very popular IELTS website www.IELTS-Blog.com, which was launched in 2005 to become a great study partner for anyone preparing for the IELTS test. You can find there a large collection of exam questions, test tips, techniques, strategies and preparation materials (books, courses, practice tests) to help you maximize your score. In 2014 IELTS-Blog.com has won People’s Choice Award in the Best Australian Blogs Competition. Simone has published four IELTS preparation books. Her most popular book “Target Band 7”, written in easy English and available as an e-book and in print, attracted over a hundred positive reviews on Amazon.com and helped thousands of test takers achieve great results in IELTS. Her newest book series “IELTS Success Formula” will teach you all you need to know to get Band 8+ in IELTS.